3. Ultra-bright LED Flashlight – Built-in LED flashlight with torch, strobe, and SOS signal modes. It has a strong beam and a fairly large lens size, perfect for replacing a tire, inspecting the engine or warning other drivers that you’re broken down. 4. 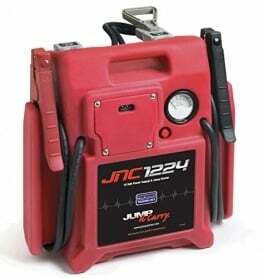 Intelligent Jumper Cable – Spark-resistant clamps reduce the sparks that fly off. Besides, it has a reverse polarity warning if you connect the red jumper cable to the wrong side of the car battery. 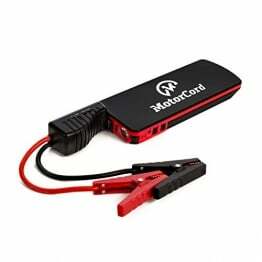 Full protection system keeps it away from over current, short circuit, overload, over-voltage and over-charge. Your Powerful Companion for Every Trip Bring GOOLOO¡¯s GP03B anywhere you go. 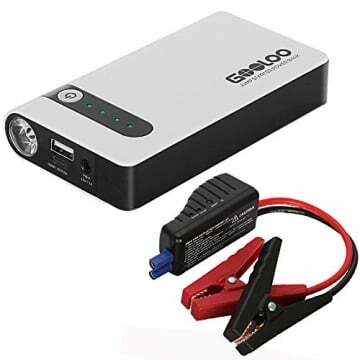 Featuring a 10,000 mAh battery with a peak current of 450 amps, it provides enough power to safely jump start your vehicles up to 3.5L gas engine. What¡¯s more? 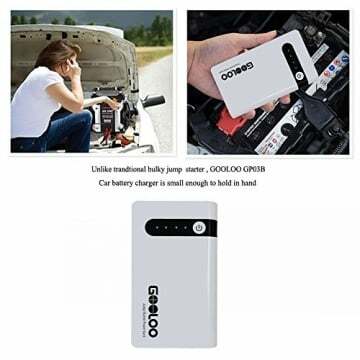 Compact enough to store in your glovebox Powerful USB Ports Whether for emergencies or everyday use, charge multiple phones, tablets and other USB-charged devices. Super bright LED flashlight. It has three illumination modes: High, Strobe and SOS. Safety with Multi-Protections. 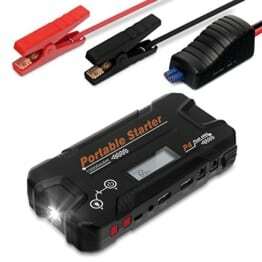 An advanced device has over current protection, short circuit protection, overload protection and over voltage protection to ensure the safety of all of your valuable devices and vehicle. Compatible vehicles: Cars – Dirt bikes – Motorcycles – Boats – Yacht – under under 3.5L gas engine.